In a new paper, published in Zoological Journal of the Linnean Society, Dr. Lena Grinsted, an early career research fellow in the School of Biological Sciences at Royal Holloway, together with American and Indonesian collaborators describe the new spider species and name it Chikunia bilde. The species is closely related to another spider called Chikunia nigra, and unlike most spiders that are typically aggressive and cannibalistic, the two Chikunia species like to live in harmony together in large colonies. This is the first record of any colonial spider groups made up of two species that are each other's closest relative. 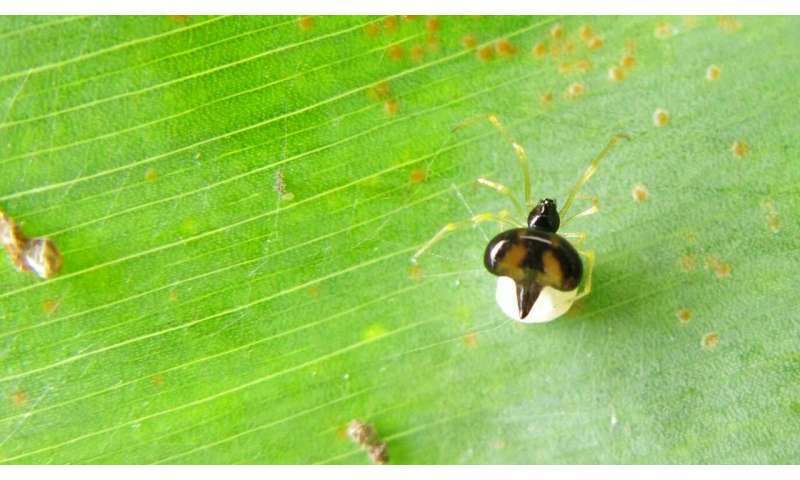 The living arrangements are intriguing, not only because mixed-species spider associations are rare, but because both Chikunia species were found to feed their young and possibly extend this care to neighbouring young. And due to their harmonious lifestyle, and non-harmful nature towards humans, they would make incredible pest controllers. As they love to eat white fly which cause havoc on crops and mosquitos that carry disease and since they don't attack and eat each other when their population grows to high densities, they could help to protect both people and agriculture, reducing the need for chemicals or pesticides. Dr. Lena Grinsted, from the department of Biological Sciences at Royal Holloway, said: "I came across this new spider species by chance while in Bali investigating their relatives. Surprisingly, the new species was hidden in plain sight within the colonies of C. nigra. "They are very tiny spiders, and unlike any I have seen before as they commonly aggregate in these multi-species colonies. The two species are so similar that they are almost impossible to tell apart. "They clearly find close living with both species attractive, and yet they manage to keep their genetic lineages separate. Most spider species are very aggressive towards other spiders and live solitary lives and wouldn't dream of living in such close proximity to each other. "Not only are they unusually tolerant towards each other and their close relatives, they are also unusually tolerant of human activity. Indeed, they appeared to prefer gardens, areas of heavy agricultural use and local dumps, where food waste and animal husbandry were attracting lots of flies and mosquitos. "We still need to study them more, but it's been very exciting to find a new species of spider with such a unique habit of living with others that has great potential for biological pest control." The tiny spider ranges from black or brown to orange and yellow in colour and belongs to the cobweb family Theridiiae. Awww its kinda cute too! I want them here where I live.